In her new solo exhibit at Artspace 111, the Fort Worth painter creates time and space. Cover art: Devon Nowlin Cover design: Louis Dixon. The rift between the past and the present, I get, though I would say the “distant” past because most of Nowlin’s paintings are informed by vintage photographs circa World War II and maybe even earlier. The only people who remember that time are either old or dead, and in them, we can realize the keep-you-up-at-night power of the great equalizer. There’s a photo on my desk from an old greeting card of two young ’50s-era couples in dress clothes dancing. Sometimes (like when I’m listening to really sad music, which I do a lot, BTW) I stare at the youthful faces and imagine them as old men and women, so full of life but now, like everything else, gone. But they were once so happy –– how do we make sense of that? You can’t think about it. It’s just too sad. Best to just move on. Let the day-to-day consume you until you wake up one day as another person or there’s nothing left of you. Which brings up the second part: “an era of collective aspirations with an era of corporately manufactured desires.” While I like the sentiment –– indeed we were more community-oriented just a few short decades ago –– I don’t think I fully understand it. What I’m trying to say is that nothing pertaining to “corporately manufactured desires” comes out in Nowlin’s work. Familiar Strangers is simply a mesmerizing collection of masterful paintings that are heavy on a retro vibe and represent the artist’s own particular brand of subtle surrealism in the best ways possible. Appropriately (or not), by the time I reached “The Honeymoon,” The Archies’ “Sugar, Sugar” was playing on low volume through the gallery speakers. The painting is of a burly guy standing behind a young couple, his arms around them both –– for the time being. The woman appears to be attempting to pry the Marlon Brando-esque brute’s paw from her shoulder with her left hand. Despite the dark undertones, the painting is still sort of transportive. The palm trees in the background, a kind of stoic Greek chorus, suggest the island life, and the clothes –– dressy with bold patterns –– hark to Father Knows Best. I wasn’t alive back then –– and I’m glad I wasn’t –– but I can certainly see the romance: the opening era of possibilities, the wonderment, the “collective aspirations.” As the book says, we bowl alone now, but why is that necessarily a bad thing? Nobody separates water fountains anymore either. 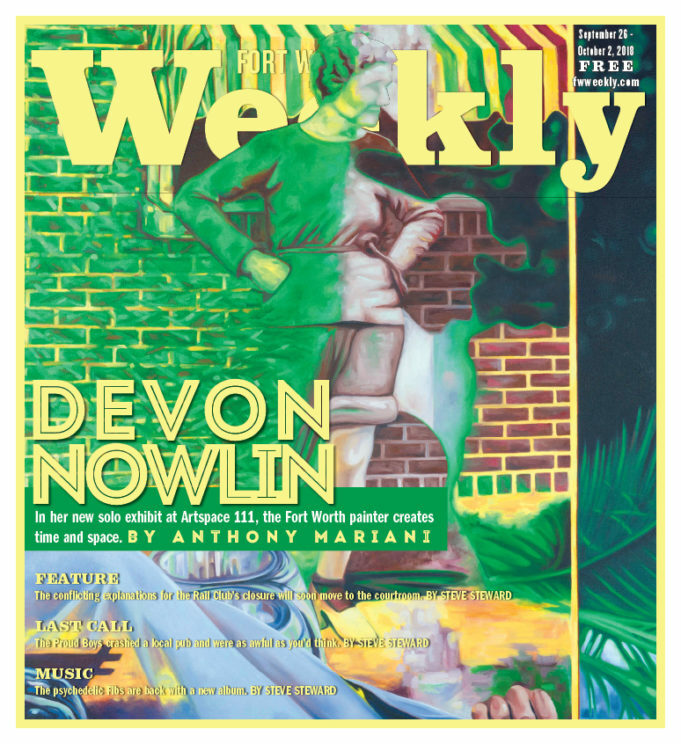 Nowlin’s technique is delightfully, slightly impressionistic. For us viewers, being able to feel the paint with our eyes is part of the fun. 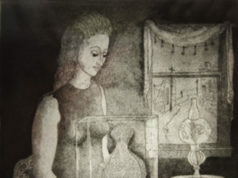 She’s still able to create translucent reflections and diaphanous patterns. Photorealism is great and all, but without a message –– even if it’s political, even if it is, like most of Nowlin’s, suggested merely than stated –– what is the photorealist doing that the photographer isn’t? When art becomes an Olympic sport, I’ll root for the photorealists (and Marshall Harris) every time. Until then, ensnare us in your wild imagination, artists. Lord knows we need some escape. Some of us may even need something to hang over the fireplace. “Painting for Men” is pure poetry. Courtesy of the artist. Easily the most striking piece in the show is “Painting for Men.” On a canvas about half the length of one of Artspace 111’s long walls, two young men form a kind of human wheel, one guy on the grassy ground and the other in the air, with their hands locked onto each other’s ankles. The lower bodies of male soccer players with soccer balls hover in the layered, loud yet tranquil background, a fever dream of flowers flowing in and out of the space and the figures –– in the upper right-hand portion is a shadowy golfer, a putter in his hand. Like the best poetry, “Painting for Men” offers the suggestion of a message, which draws you in and keeps you looking. 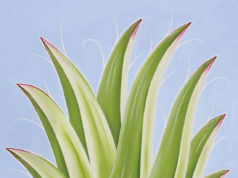 Thru Oct 6 at Artspace 111, 111 Hampton St, FW. Free. 817-692-3228.